In the last post, I have explained the benefits of trading forex over trading stocks. Here in this post, I am going to explain the structure of forex market and the key players in forex. A stock market is a centralized market where all orders go through a central point, which is the ultimate controller of the price of a stock. That is the main reason why stocks market is manipulated. However, the forex market is a decentralized market, where price manipulation is almost impossible.In the image below, you can see the structure of the forex market. From the forex market structure illustrated in above image, it can be easily understood why the forex market is not manipulated. The participants of forex market include the central banks, commercial banks, ECN brokers, market makers, investment funds, large speculators, and retail traders. We are the retail traders who trade with relatively small initial investment, and we are in large number. In the image below, the hierarchy of forex market is presented. 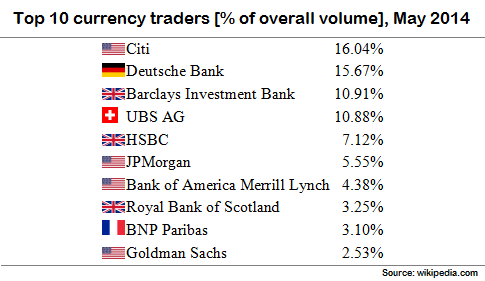 At the top of the forex hierarchy is the major banks. This group of participants are the large banks of the world, who trade directly with each other or electronically through the Electronic Brokering Services (EBS) or the Reuters Dealing 3000-Spot Matching. The fight between EBS and Reuters Dealing 3000-Spot Matching is like the Tom and Jerry. They continually try to achieve more market share in the market. The liquidity of the currency pairs defers in these two institutions. The EBS and Reuters Dealing 3000-Spot Matching are in the second step of the forex hierarchy. 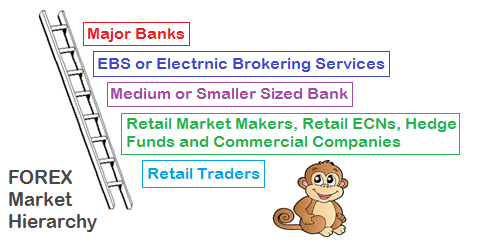 In the third step from top are the different medium and smaller size bank, who trades through interbank trading network. In the fourth step from top are the retail market makers, retail ECNs, hedge funds and commercial companies. These forex participants trade through commercial banks. That is why the price received by these participants are little higher than the price enjoyed by the large banks. In the bottom of the forex hierarchy are the retail traders, who trade with relatively low initial investment. The number of retail traders growing daily basis, and in near future the group of retail traders may become more powerful. 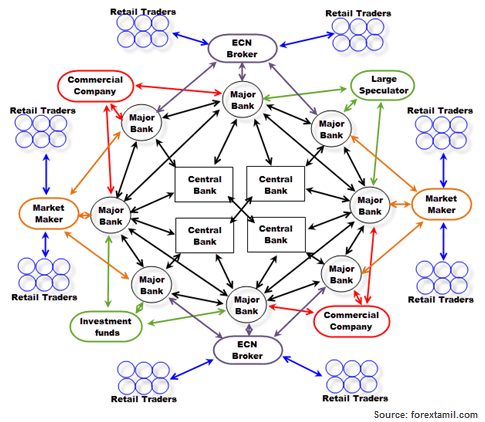 The internet revolution in recent years is responsible for the huge number of retail traders in forex. According to the wikipedia.com, the above institutions are the top individual forex traders in the world. The ranking is on the percentage of the overall trade volume. Now the question is "Why do forex traders need to study market structure?" The answer is that the understanding of forex market structure helps the traders to understand the price movements and market behavior. It also helps to understand the cot report and to interpret it in trading forex.